Basketball game NBA2K14 has risen above FIFA 14 and Madden 25 to become the best-selling sports game on the next Xbox One and Sony PS4, according to November sales data from the US. 2K Sports' reimagined hoops simulator, which offers a refined control system and greater detail, beat out EA Sports' more illustrious football and NFL franchises, which usually rise to the top of the festive tree. It's the first time a basketball game has topped the sales charts for a new consoles, 2K sports claims. However, when current-gen systems are factored in, Madden 25 has a slight edge. A 2K rep told The Examiner: "This marks the first time ever an NBA game topped the charts as the best-selling sports title at the start of a new console generation." The developer must be delighted with the success after partnering up with Miami Heat star and multi-time league and Finals MVP LeBron James as the cover artist. "NBA 2K14 for PlayStation 4 and Xbox One distinguished itself by providing an entirely new experience designed specifically for next-gen platforms, featuring all-new game modes distinct from the current-gen version of NBA 2K14. 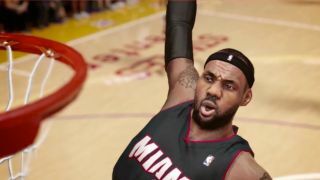 "We partnered with the King of Basketball, LeBron James, as our cover athlete and delivered an unprecedented level of realism, making NBA 2K14 a showcase for the potential of next-gen gaming," said Jason Argent, SVP of Basketball Operations for 2K Sports. 'King James' may have jumped higher than the rest, but can he hold onto the crown over the festive season or will Messi and Madden strike back?